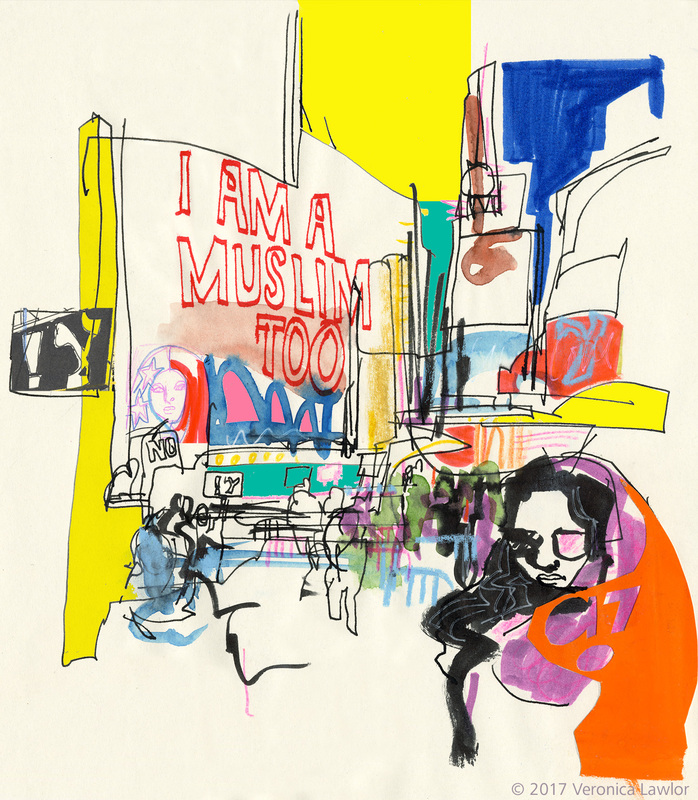 Last Sunday, organizers put together a rally in New York’s Times Square, titled: “Today, I am a Muslim Too.” The rally was set up as an a-political event in support of the large Muslim population of NYC. As an entry for so many immigrants for so many years (See: Ellis Island post here) this city is very serious about our reputation as the melting pot of America. 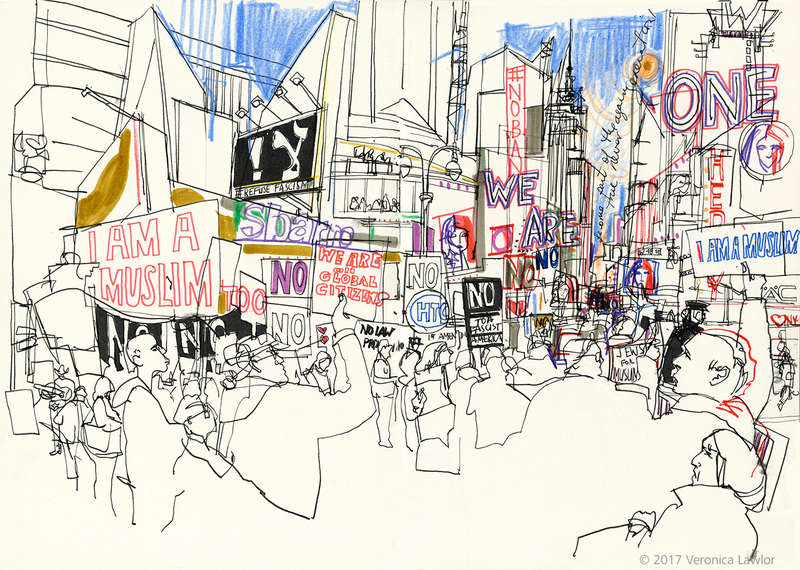 And thousands turned out in support of our city’s Muslim citizens as well as more recent Muslim immigrants, filling Times Square. There were many Muslim speakers who denounced terrorism and asked please if we could blame the terrorist groups but not the whole religion, and come together to resist terrorist acts. 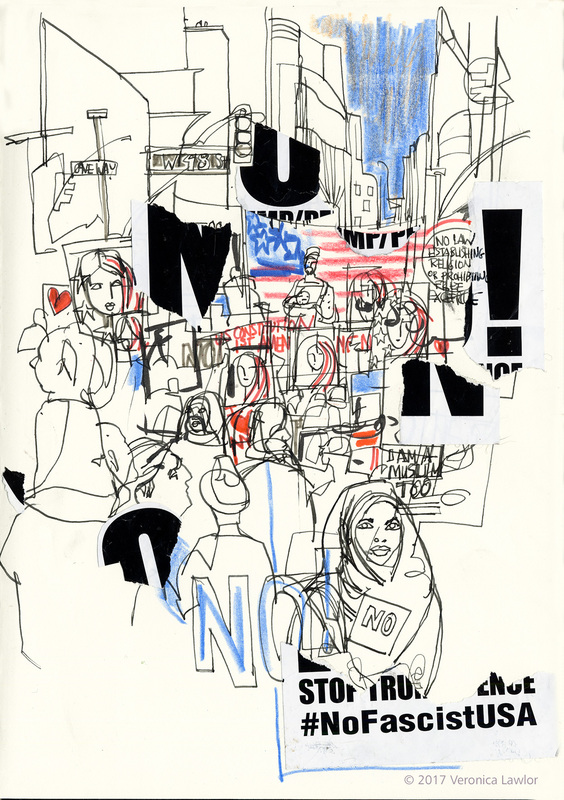 Other speakers from different backgrounds got up in support – Mayor Bill DeBlasio led the crowd in a chorus of solidarity, saying, New Yorkers, Americans, “WE ARE ONE!” There were signs and banners as far as the eye could see, adding to the already blinking commercial cacophony that is Times Square. 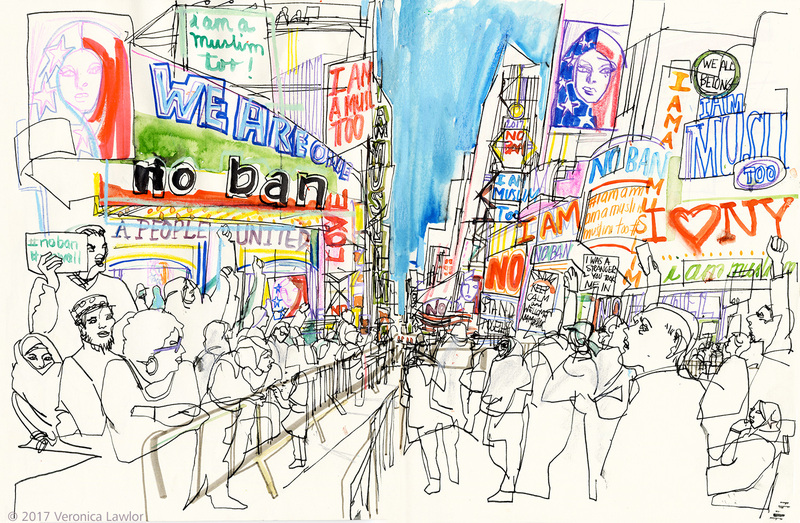 I thought of all the voices and all the messages mixing with the advertisements, until Times Square became one large advertisement for compassion and inclusivity. Wouldn’t that be something? A day of advertising for peace and cooperation? Wow. 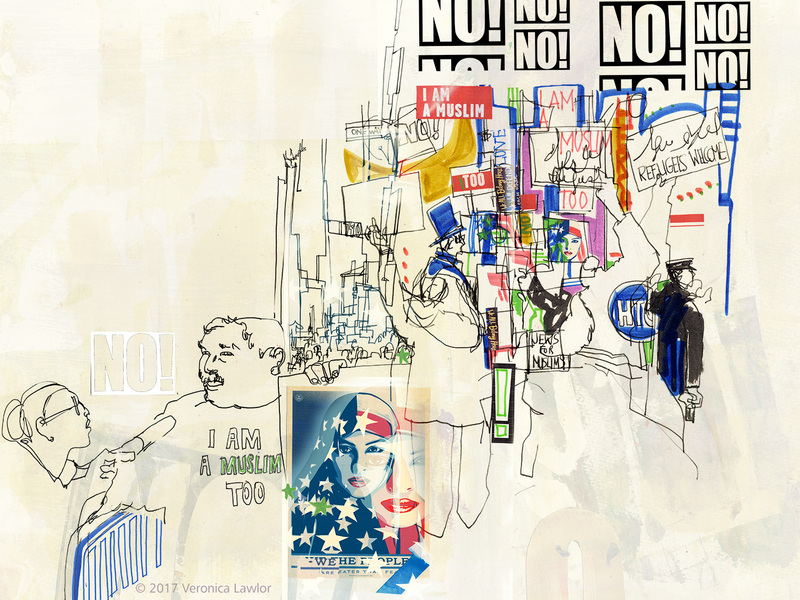 The message could grow and grow, blinking for 24 hours: We Are One America! Something beyond Republican or Democrat, just people. After all, Times Square is known as the crossroads of the world. “I am Muslim, Jewish, Catholic, Christian, Buddhist, Shinto, Hindu, etc. etc.” – as one sign said, “We ALL Belong Here.” That’s what makes America so unique – the grand experiment in democracy. Imagine coming together like that, to truly solve the issues we face, with compassion and without scapegoating? I’d vote for that any time. That kind of solidarity was on the minds and signs of the crowd, as they chanted slogans and talked with the many reporters swarming the area. It’s a wonderful thought – idealistic, maybe, but I’m holding on to it. 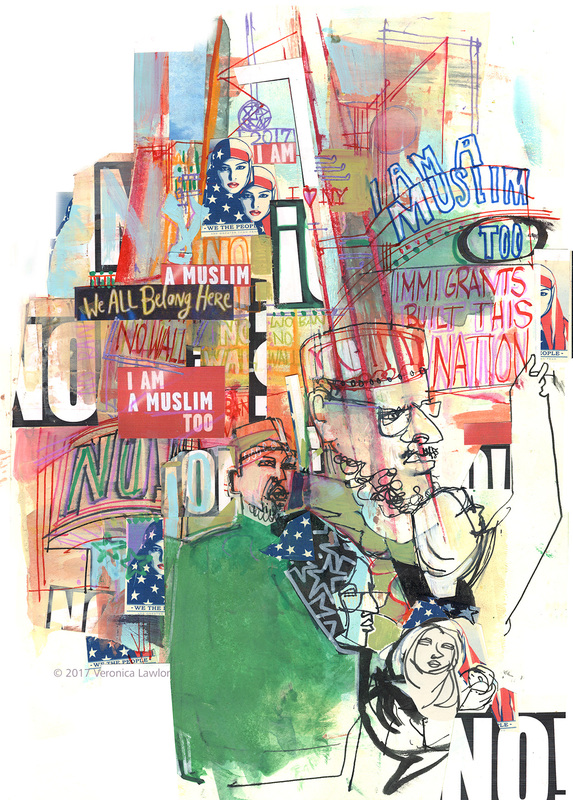 And, I think, so were many of the Muslim families I saw in the crowd that day. This extended family (above) was so sweet; the girls were all very shy, but quite interested in what I was drawing. 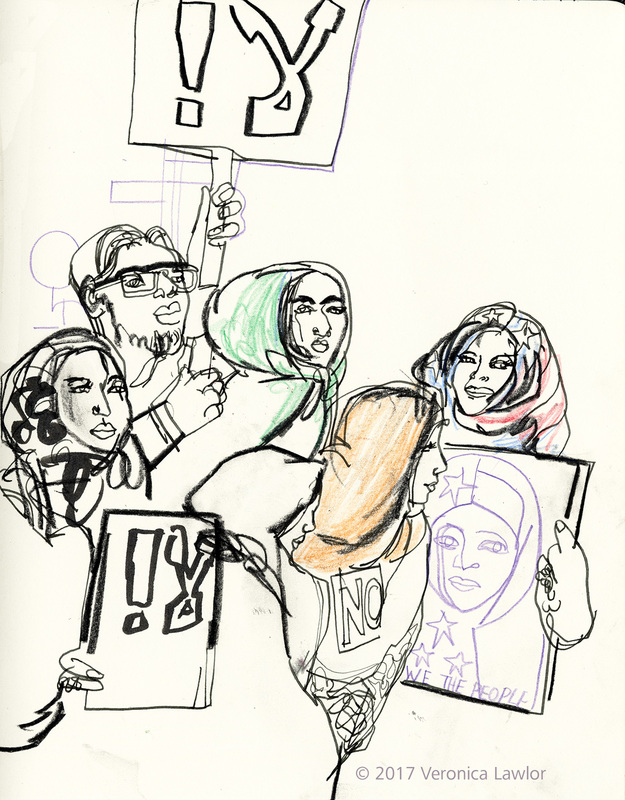 The one girl at left, Sumaia, is in the drawing twice – in her other appearance she is wearing not only the hijab but also the niqab, which is the full facial covering. Her sister suggested she take it off so I could draw her face; her father agreed, saying, “It’s OK, she is a woman.” The girl seemed hesitant, so I told her please don’t do anything you are uncomfortable with. 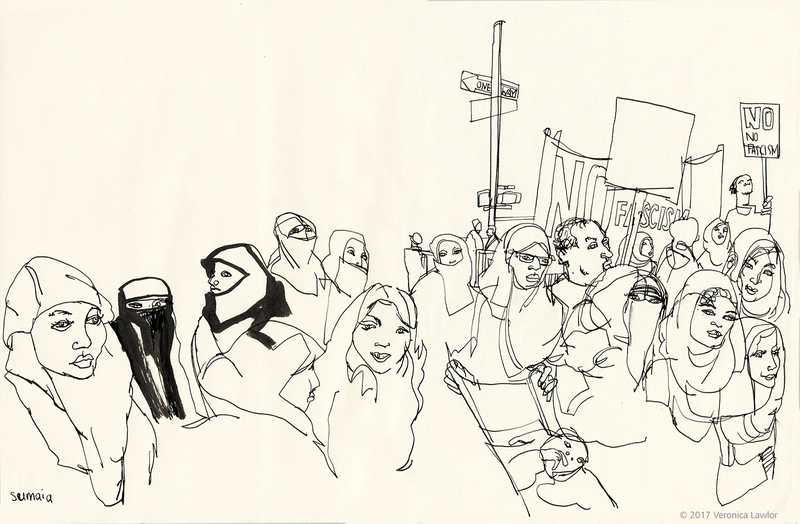 I kept drawing, and then out of the corner of my eye I saw her adjusting the niqab. “Wait,” I asked her, “did you just remove that so I could draw you?” She nodded yes. “Would you like me to draw your face?” I asked. She nodded yes again. Then she slowly removed it and stood still so I could draw her, never looking directly at me once. What a beautiful moment of trust; it made me want to cry, but at the sam time it made me feel so happy and hopeful for a resolution to all the conflict going on. As the rally wound down, the streets cleared out, except for a scattering of people. One small group was angry, and one of the men was yelling about fascism into a megaphone. A small boy was attracted by (I think) the emotional intensity, and asked for the megaphone. He then called out: “Trump is mean, and Pence is a little less worser!” Ha ha, he wanted to contribute something. But in the relaxing of the militancy of his message, the gesture of the man giving the megaphone to the little boy calmed down the overall atmosphere. A little trust can go a long way, and maybe a little more communication could help too? 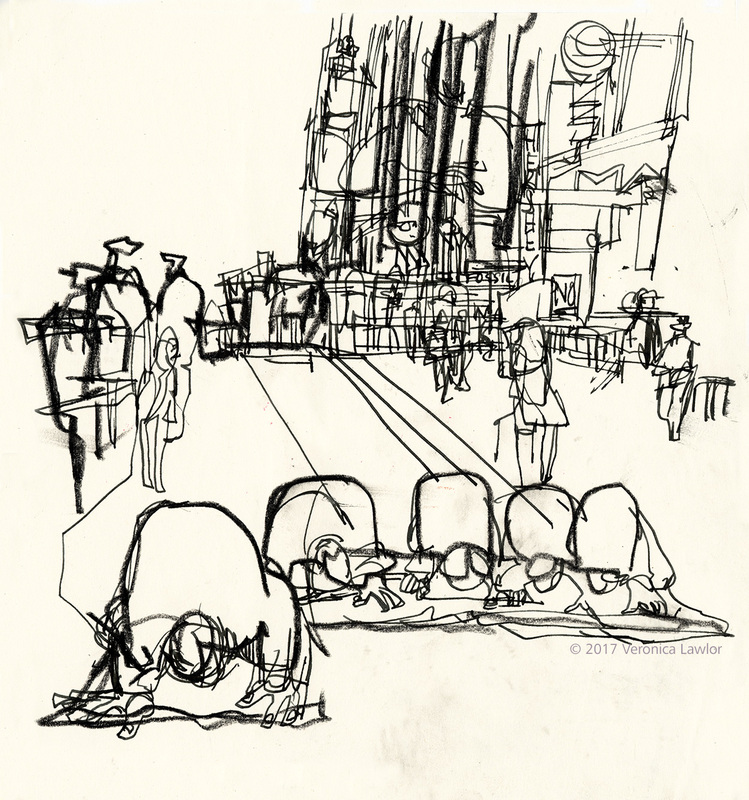 As I met my friends (who were also drawing the rally) and we got ready to go get some coffee together, we saw this group of Muslim men praying in Times Square. I’m praying too, hoping that we can figure out this new chapter in our American story, and ease the tensions on both sides of the aisle, so to speak; as well as come together to protect the most vulnerable in our society. 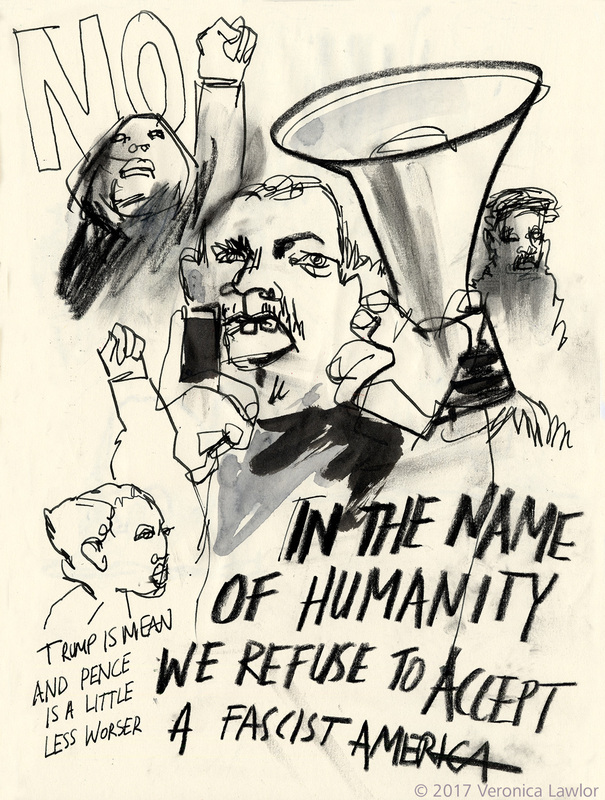 If you’d like to see more drawings of the event from all of the reportage illustrators who were there, check out #artistsfordemocracy on Instagram.